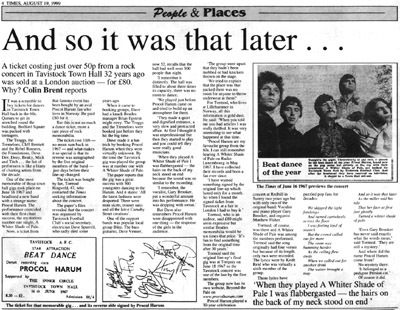 Many thanks to Tormod Ringvold for this fascinating feature, which records some of the very earliest impressions of a Procol Harum gig – from the Royer / Harrison line-up, in fact – that BtP has so far come across. I bought this ticket, which I normally refer to as "The Tavistock Ticket", at the London Victoria Record Fair in May 1998. 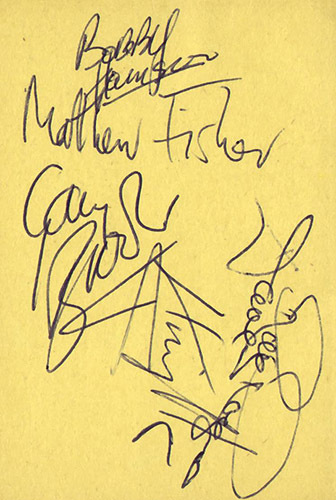 It is from a "Beat Dance" at Tavistock Town Hall on 16 June 1967 and is signed on the backside by Gary Brooker, Matthew Fisher, Bobby Harrison, Dave Knights and Ray Royer. I was told that the ticket came from a collection of one of the organisers of the concerts in Tavistock, Devon, who had made it a habit of getting the groups to sign a ticket on the night. This man had recently died. There were several tickets, signed by other groups like The Troggs, The Tremeloes and Dave Dee Dozy Beaky Mick & Tich, but I went for Procol Harum. There was one problem, however. In Shine On I could read "Procol played their last gig for some time at the Marquee Club - 12.6.1967." If this was true, what about my ticket ? With the help of Shine On, the Procol Harum expert Frans Steensma from Holland informed me that the final gig with Harrison / Royer in the line-up in fact was in Torquay on June 18. So far so good. I wanted to know more about this event, and with the help of the internet, I found the local weekly newspaper of Tavistock, the Tavistock Times Gazette. I contacted the newspaper and told about the ticket, my fond interest in Procol Harum and asked if they had archives back to June 1967 - and if so, was there any mention of the concert? Once again, the English enthusiasm and helpfulness showed. An answer came immediately. I was told they indeed had the archives, and they had found that the Procol Harum concert was mentioned on three successive Fridays, first one week before, then the 16th, and finally the week after. ( I ought to mention that the newspaper was issued only on Fridays in 1967). I found out from the articles: back in the late sixties, the football club in Tavistock organised concerts at the town hall. The football club's social secretary, Dave Spurrell, did a great job in booking groups just before they hit the big time. Among the groups that played in Tavistock were The Troggs and The Tremeloes. 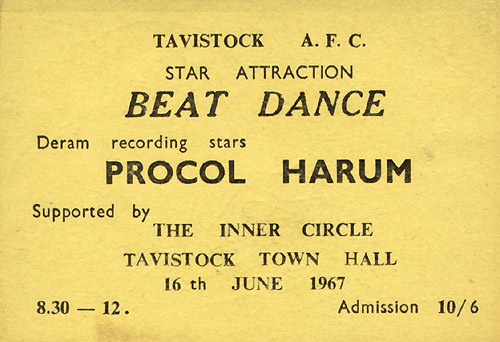 On June 16th 1967, with A Whiter Shade Of Pale at No 1, Procol Harum played in Tavistock. Dave Spurrell had died some years ago. This must have been the man who got the tickets signed. It fits in well with the story the vendor told me. But first, back to 1967. A knack that a Brian Epstein might envy. That's what Tavistock electrician Dave Spurrell has. The knack is picking winners from the score of groups on the pop scene. Dave finds them with monotonous regularity. First it was the Troggs. They were just another group when, as Tavistock soccer club's social secretary, he booked them for a fund-raising beat dance. When they arrived they were on the crest of a wave. He followed this with the Tremeloes. Right on the heels of their appearance at Tavistock came their chart-topping disc, Silence is Golden. Now it's third time lucky. Dave is slap on target with his choice of the Procol Harum. Unknown a few weeks ago, now they top the hit parade with their sensational A Whiter Shade of Pale. Next Friday they will be starring at the soccer club's dance at the Town Hall. Their leap to the top of the charts was closely copied by a leap in their booking fee. Dave is cagey about how much he is actually paying the Procol Harum (the name belongs to a pedigree Persian cat). But he'll be lucky if the group's five members take away less than £ 40 apiece. Tonight's the night. Theoretically at any rate, it should be the beat dance of the year,. Procol Harum, brand new on the pop scene but already at the top with their sensational A Whiter Shade of Pale, are booked for Tavistock Town Hall by Tavistock Football Club. And after the treatment they have received on television, it should be a Town Hall sell-out. 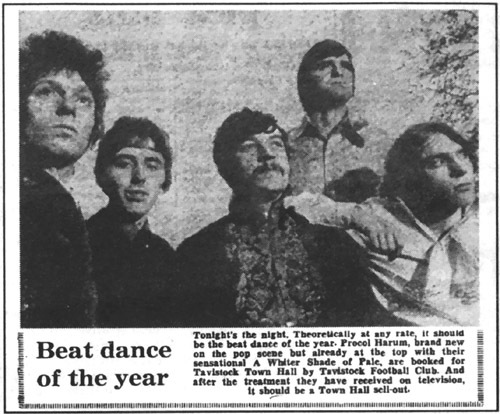 Hundreds of teenagers poured into Tavistock on Friday night to hear Procol Harum beat group play at the Town Hall. They came by coach, motor-cycle, bus - and the odd vintage car to see the group who are currently at number one in the hit parade. All the latest fashions were desported in the town's streets and public houses. There were mini-skirts, trouser suits and all the latest Carnaby Street creations. And inside there was terrific excitement as around 500 youngsters danced to the Inner Circle group - and waited for the Harum to arrive. When Times reporter John L Brook went to interview the group back stage, he ended up being interviewed himself. For lead guitarist Ray Royer is an old friend and he wanted to talk about the "good old days" in Romford, Essex, where John and his wife Jill ran a club. Ray used to be a member of the club. The fans screamed as the group went on stage to play for an hour. The group's hit record, A Whiter Shade Of Pale, has rocketed from nowhere to top of the charts. The five boys are still surprised about this. I got a copy of the newspaper [right] by mail, just in time for sending the text to Jens Anders before he went to England to lunch with Gary Brooker. Jens Anders had shown it to Gary, who had read it with great interest. Click here to read a transcription of this whole, fascinating article.